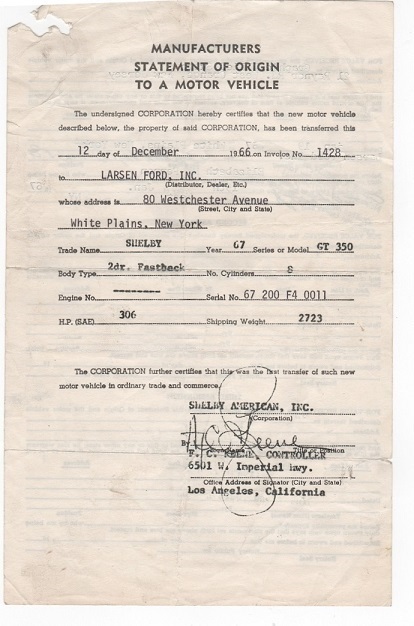 Larsen Ford was located at 80 Westchester Avenue in White Plains, New York. White Plains is just north of New York City. 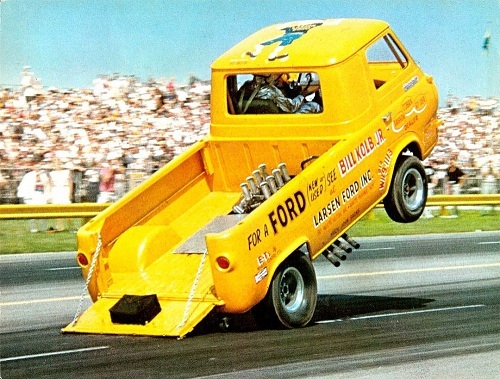 Larsen Ford was a performance dealer. They sponsored some heavy Ford muscle. The dealership sponsored a Thunderbolt, a factory AFX car and Bill Kolb's crazy wheel standing truck, just to name a few. That was the direct result of one man, salesman, Bill Kolb. Mr. Kolb is without question, the greatest salesman ever. The dealership sold several big block Cobras. 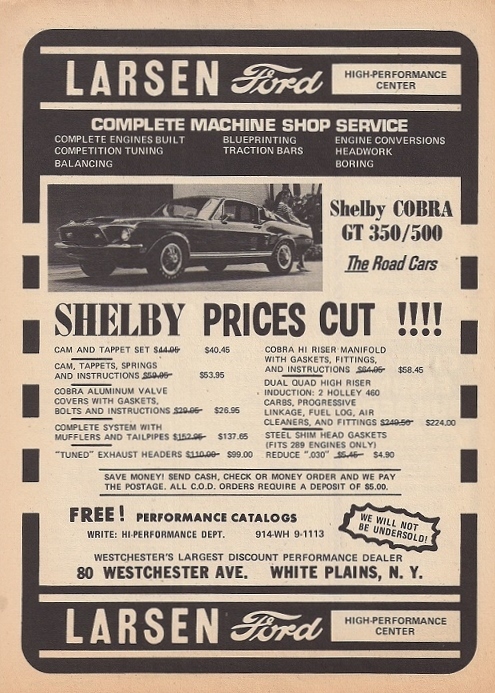 They sold nine 1965 Shelbys. Sometimes we forget these dealers were trying to make money. Here's a check for nearly a $1,000 to Larsen from Shelby. 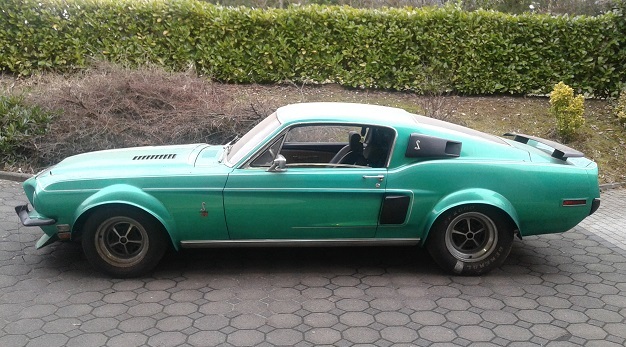 By 1966, they managed to sell 160 Shelbys. 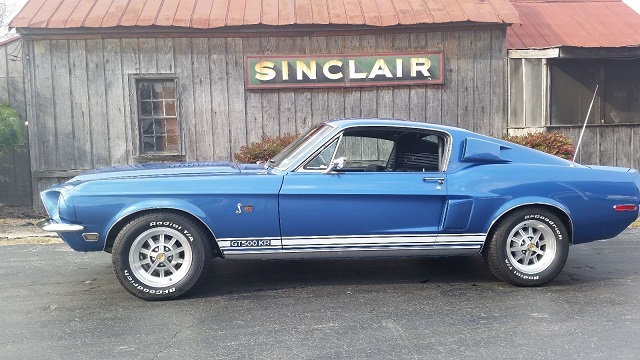 They were still selling parts like this 427 crank, carb and GT350 side stripe kit! 1967 saw the departure of Bill Kolb and sales dropped off dramatically. Larsen couldn't even crack the top thirty in sales. This document is the MSO or Manufacturer's Statement of Origin. Think of it as the original title to the car. 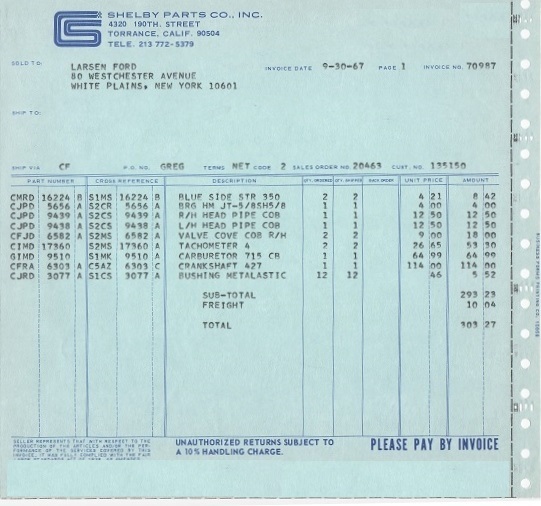 1968 saw sales rise slightly from 1967 to a dismal 36 Shelbys. 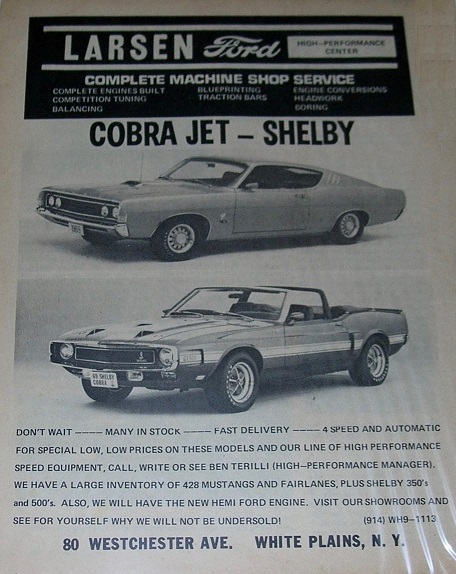 This ad appeared in Super Street Cars magazine. 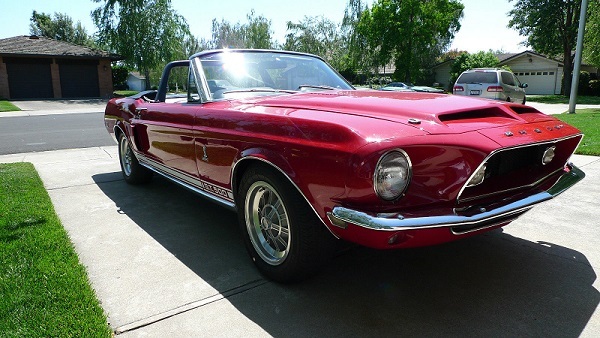 Number 255 is a red, GT500 came from the dealership. 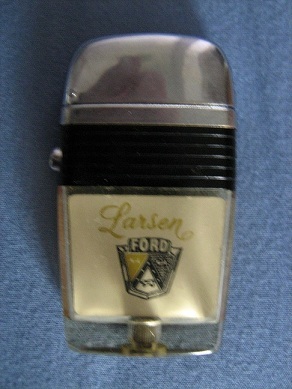 A vintage Scripto lighter from Larsen Ford in New York. If you look around these items are still out there. 828 is an original Larsen car. It has seen a little modification since leaving the dealership. 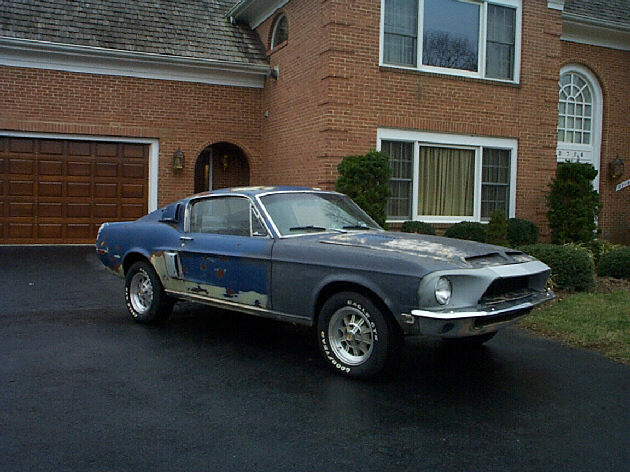 1622 was restored by Tim Lea and is a former SAAC Concours Gold Champion. Here is an old picture of 3276. The original owner actually lived in Elmira, NY. That's quite a haul from White Plains! I'm not sure what # 3485 looks like today, but it was ready to be driven hard in this picture. Car number 3579 almost looks old school in the black and white photograph. 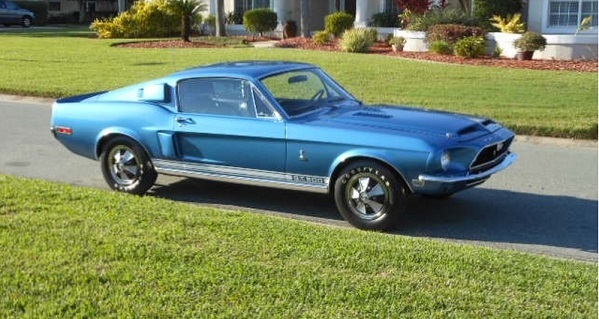 How could you not like an Acapulco Blue GT500 KR ? Serial number 3763 is looking good. 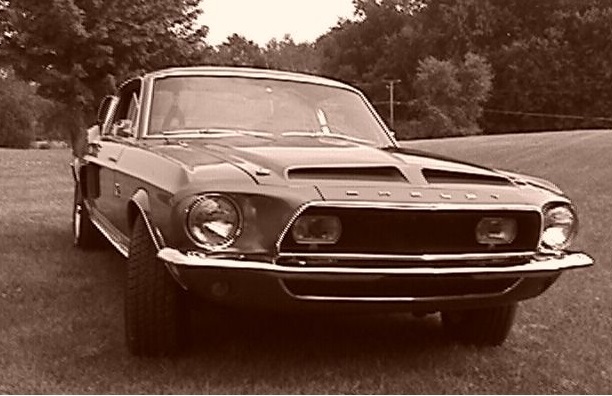 A respectable 50 cars were sold in the final year of Shelby production. Larsen Ford has moved from the 80 Westchester building. 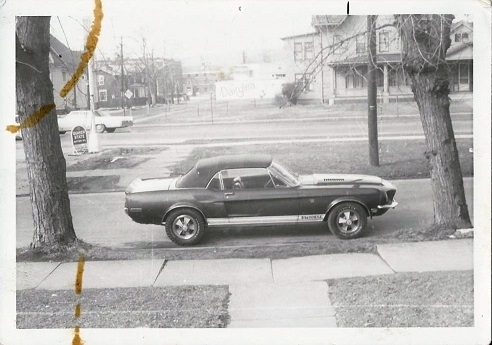 It was later occupied by Smith-Cairns Ford and then White Plains Dodge.